24 mini chocolate foam kisses in the three delicious chocolate varieties milk, dark and white chocolate. 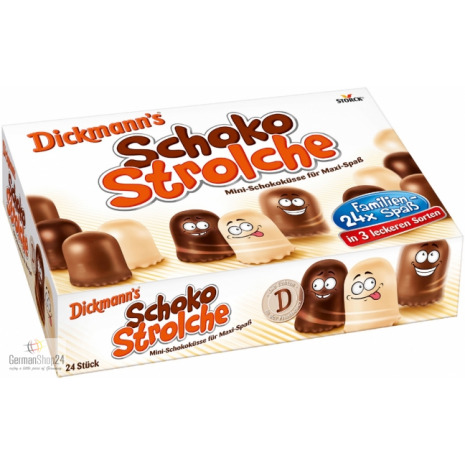 Dickmann’s Schoko Strolche brings the whole family in a good mood, because these mini chocolate foam kisses make fun always and everywhere. They are so small, so cheeky, so foamy and so wonderfully chocolaty and in the mini format it never gets boring. 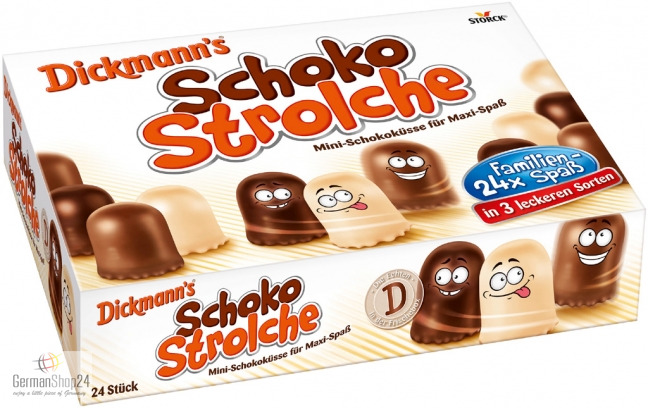 In the three delicious chocolate varieties such as milk, white and dark chocolate, there is definitely a favorite „Strolch“ for everyone in the family. 24 mini chocolate foam kisses are included the freshness box. This product has a very short Best-Before-Date (BBD). Glucose-fructose syrup, chocolate (sugar, cocoa mass, cocoa butter, emulsifier lecithin (SOY), vanilla extract), milk chocolate (sugar, WHOLE MILK POWDER, cocoa butter, cocoa mass, WHEY PRODUCT, emulsifier lecithin (SOY), vanilla extract), white chocolate (sugar, cocoa butter, WHOLE MILK POWDER, CREAM POWDER, WHEY PRODUCT, LACTOSE, BUTTER MILK POWDER, emulsifier lecithin (SOY), salt, vanilla extract), waffle (WHEAT FLOUR, sugar, WHEAT STARCH, emulsifier lecithin (SOY), palm fat, CREAM POWDER, salt, raising agent sodium bicarbonate, natural flavor), humectants sorbitol, DRIED HEN'S EGG PROTEIN, natural flavor. May contain traces of hazelnuts, almonds, peanuts and other nuts. Glukose-Fruktose-Sirup, Schokolade (Zucker, Kakaomasse, Kakaobutter, Emulgator Lecithine (SOJA), Vanilleextrakt), Vollmilchschokolade (Zucker, VOLLMILCHPULVER, Kakaobutter, Kakaomasse, MOLKENERZEUGNIS, Emulgator Lecithine (SOJA), Vanilleextrakt), weiße Schokolade (Zucker, Kakaobutter, VOLLMILCHPULVER, SAHNEPULVER, MOLKENERZEUGNIS, MILCHZUCKER, BUTTERMILCHPULVER, Emulgator Lecithine (SOJA), Salz, Vanilleextrakt), Waffel (WEIZENMEHL, Zucker, WEIZENSTÄRKE, Emulgator Lecithine (SOJA), Palmfett, SAHNEPULVER, Salz, Backtriebmittel Natriumhydrogencarbonat, natürliches Aroma), Feuchthaltemittel Sorbitsirup, HÜHNEREI-TROCKENEIWEISS*, natürliches Aroma. *Aus Bodenhaltung. Kann Spuren von Haselnüssen, Mandeln, Erdnüssen und anderen Nüssen enthalten.